1 PMS color printed on Side 1 of uncoated 80lb Eco Fossil Smooth stock (currently unavailable). 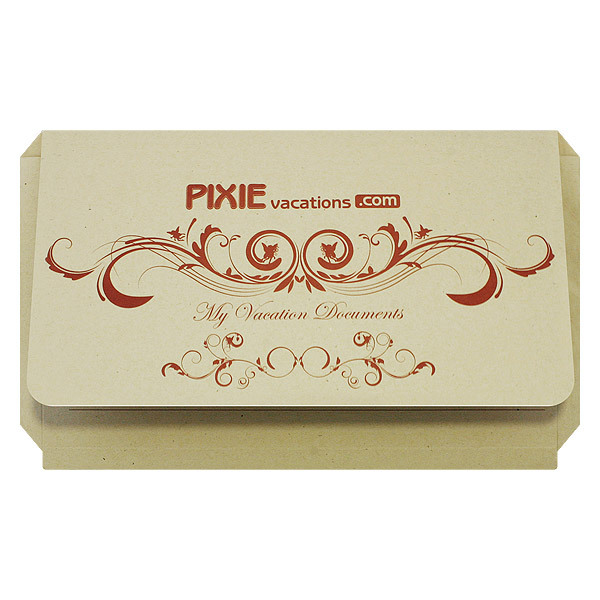 Pixie Vacations, an authorized Disney vacation planner, makes dreams come true with this fanciful design. Tiny fairies hide in the whimsical curlicues that adorn the cover. A combination of round and script fonts captures Disney's youthfulness and magical atmosphere. The expandable pocket provides ample room for the whole family's brochures, guidebooks, and travel papers. Customizable spaces on the pocket also allow parents to write in reservations, phone numbers, and flights, so they can be right on time for each adventure. 2 PMS colors printed on Side 1 of 10pt C1S White Marble Crush stock. 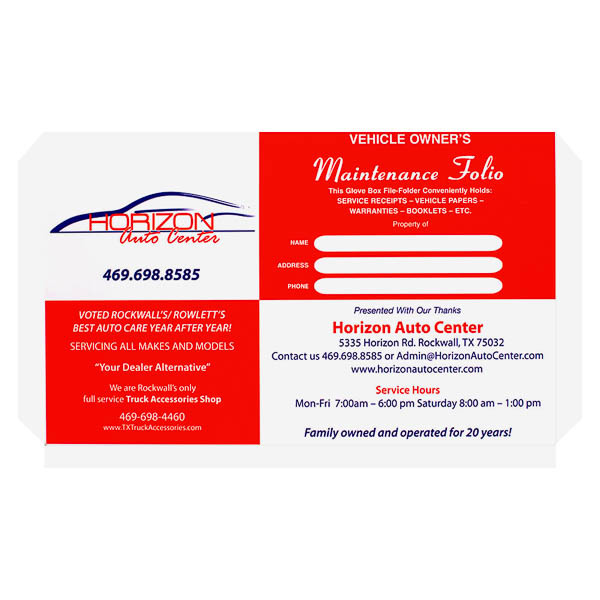 Red and white panels attract attention to Horizon Auto Center's design, making it easy to find in a car or truck's messy glove box. Dark blue text adds a slightly patriotic tone to the design. The front lists Horizon's awards, contact information, and hours, while the flap bears a form for accident information. Another form on the pocket exterior houses maintenance and trip records. Four-color process printed on Side 1 of 10pt C1S White Marble Crush stock. 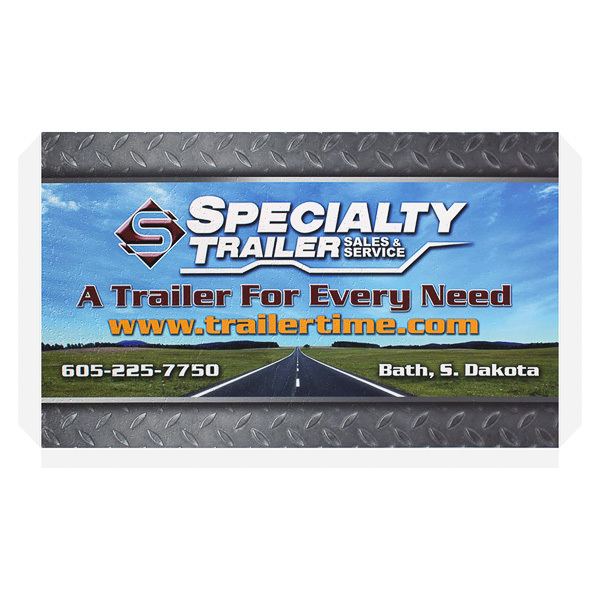 Diamond plate effects give this design the look of a metal utility trailer, like the ones sold at South Dakota's Specialty Trailer store. Below the slogan and logo, the orange URL attracts attention and encourages online shopping. The background image features a road stretching into green pastures to suggest smooth travels. Additional contact information is located on the back. Side 1 printed with 1 PMS color using light coverage. 80lb Bright White Felt stock uncoated. Curvy retro script and slanted sans serif typefaces are reminiscent of vintage cars' body styles. 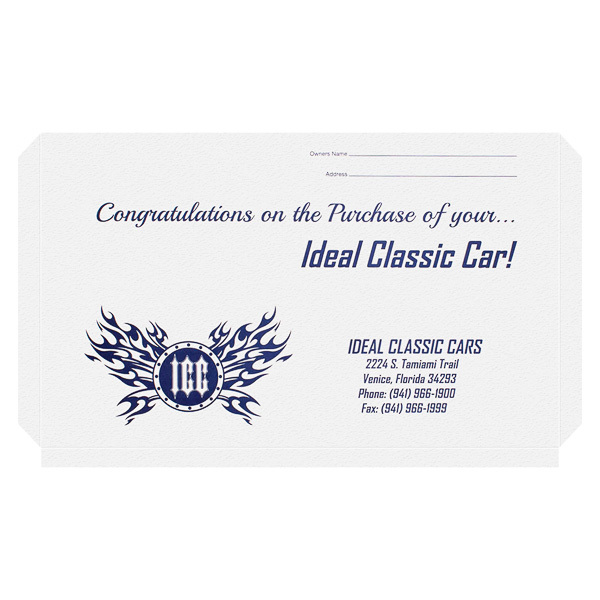 Ideal Classic Cars' flame logo sits opposite the contact information to balance the showroom's brand identity. The flap features a form on which to write information in the event of an accident. On the pocket exterior, several customizable columns let auto owners keep maintenance and trip records. An unsealed expanding gusset allows the product to match the size of its contents. The pocket holds a stack of 9 1/2" x 5 3/4" documents and half-folded letter-size documents up to 7/8" thick. A fold-over flap keeps all documents in place, regardless of how many or few there are. The landscape-oriented exterior creates a wide design canvas on which to place branded elements or custom graphics. Dimension Open: 9 7/8" x 11 1/2"